Dorothy Riester (1916-2017), a pillar in the art world of Central New York for decades, died this week at the age of 100. She had remained active and creative until the end of her life. Though not Jewish, Riester contributed some of the most memorable "Jewish art," in upstate New York with her sanctuary sculpture for Temple Adath Yeshurun in Syracuse. Designed by Percival Goodman, the Conservative synagogue dedicated its new home with Riester's powerful combined Decalogue and Ner Tamid over the Ark and menorahs on the bimah in June, 1971. Riester also created a sculpture representing the Burning Bush in Temple Adath's Cooper Meditation Garden. Her sanctuary work recalls that of Seymor Lipton, and is in every way of equal quality. Riester was one of just a handful of women sculptors who received major synagogue commissions in the 1950s and 1960s. Others were Mitzie Solomon Cunliffe, Luise Kaish and Louise Nevelson. 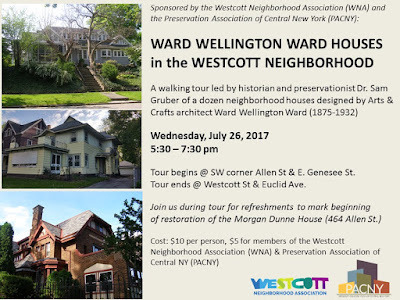 I will be leading a walking tour of Arts & Crafts style houses designed by Ward Wellington Ward along Allen Street in Syracuse's Westcott Neighborhood this Wednesday evening form 5:30 to 7:30. We'll walk from the 300 block of Allen Street to Euclid Avenue. Please note: the tour will only pass exteriors - there will be no entry into private houses. We will have a stop for refreshments at the Morgan Dunne House at 464 Allen Street to celebrate the inclusion of the house on the National Register of Historic Places, and to hear plans for the upcoming restoration. The tour starts at the SW corner of Allen Street and East Genesee Street. The tour will proceed if there is light rain. If there is a deluge we will reschedule. 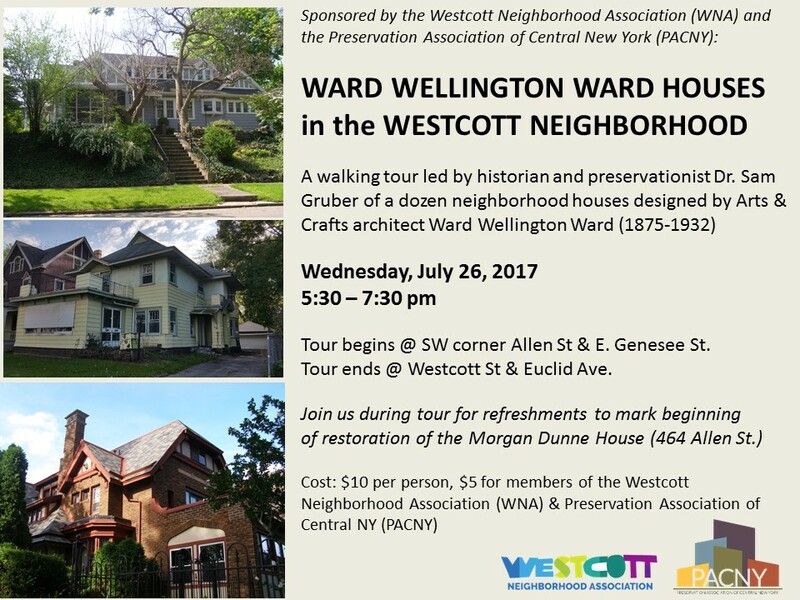 The tour is sponsored by the Westcott Neighborhood Association (WNA) and The Preservation Association of Central New York (PACNY). Tickets are $10, or $5 for WNA and PACNY members. Organization memberships will be available at the tour. I will discuss Ward's career, local trends in Arts & Crafts inspired architecture as well associated historicist styles and vernacular trends. I'll also speak a bit about the overall development of Allen Street. 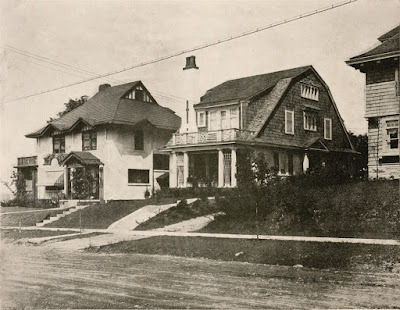 Between 1910 and 1923 Ward designed more than a dozen houses in the area, with about the same number designed and built in the University area immediately to the west. Even more houses by Ward were built by Ward in walking distance - in the along Salt Springs Road and in Scottholm .- we can visit these on another tour. Ascending any of the roads of Thornden Park, or coming up the hill from Clarendon Street to Ackerman Ave., one makes for the highest point where sits a massive round tower. Or, like Luna and me yesterday, you can skip the road and just climb the very steep hill rising opposite the Thornden swimming pool. The tower is actually the Elon P. Stewart Reservoir, which holds 2 million gallons of water and is a key part of the city's water system. It is gravity fed by Skaneateles Lake (860 feet), which is higher than Thornden (732 feet). The reservoir (or standpipe) buitl in 1925-26, rests 372 feet above the level of Onondaga Lake. It was originally just called the Thornden Standpipe, is now named after a former city water engineer. 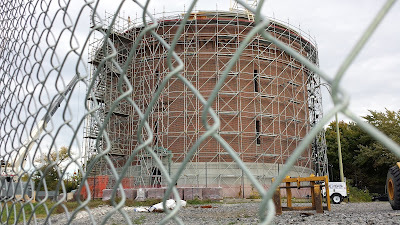 The steel tank, which is enclosed in a masonry building, is 77 feet across, 60 feet high, and open at the top. When it was constructed, engineers boasted that if every house in the neighborhood flushed their toilets at the same time, there would be no drop in pressure. don't know if there was an architect involved - even for the exterior decoration - but the superb masonry work was done by Hueber Bros., Inc. (now Hueber-Breuer). Syracuse, NY. Elon P. Stewart Reservoir in Thornden Park, Entrance portal. Photo: Samuel D. Gruber 2016. The simplicity of the building - the pristine geometry of its great cylinder - is what makes the structure striking yet calming. The roots of this design go back to the Pantheon in Rome. These water reservoirs have always reminded me of the Martello Towers in Ireland, too. For more contemporary architectural use of the cylinder see the works of Louis Kahn and Mario Botta. Rome, Italy. The Pantheon, 2nd century. Photo: Samuel D. Gruber ca 1985. Rome, Italy. The Pantheon, etching by DuPerac, ca 1575. Dhaka, Bangladesh. 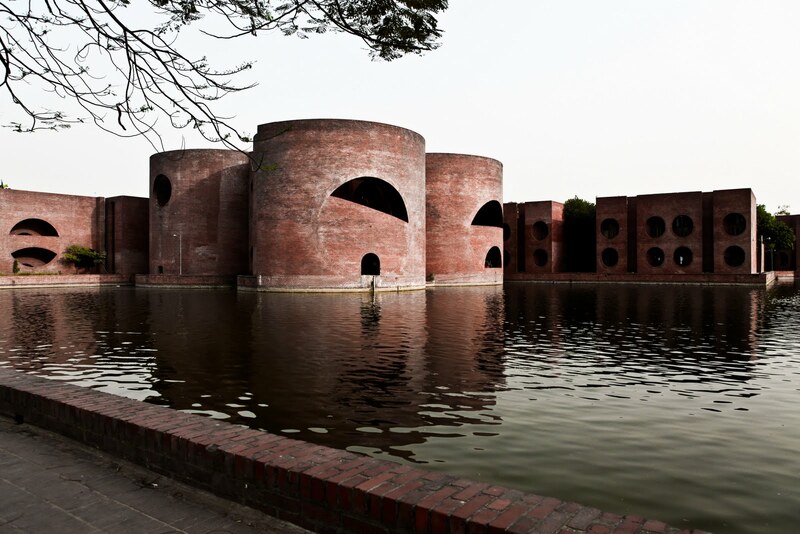 Bangladesh National Assembly, Louis Kahn, arch, 1982. photo: web. Évry (Essonne), France. 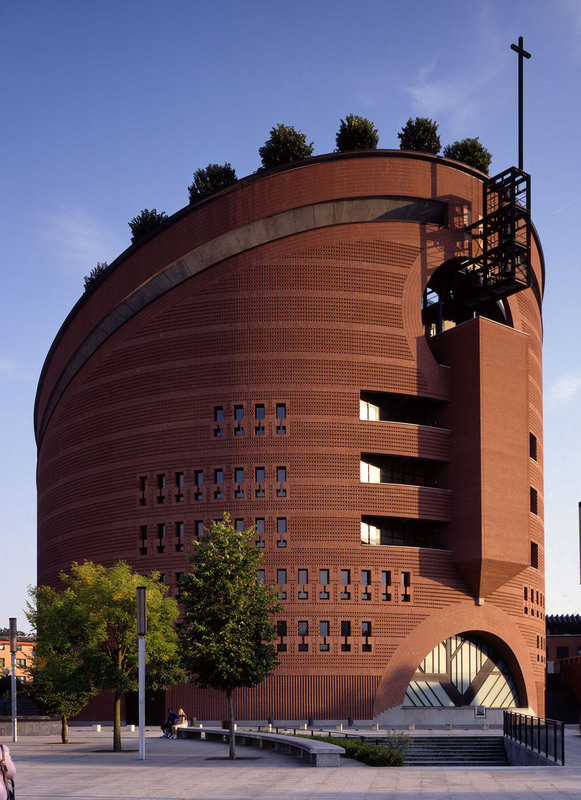 Cathedral of the Resurrection, Mario Botta, arch., 1995 Photo:web. 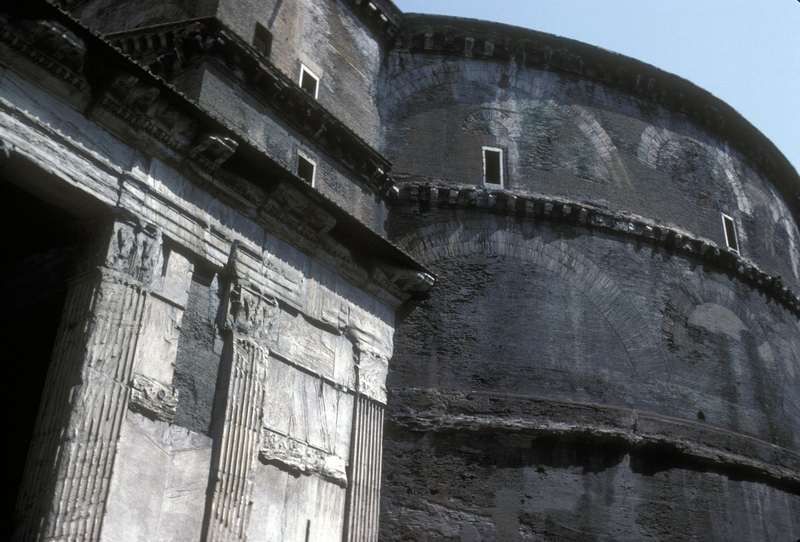 In keeping with the Pantheon, this brick cylinder has a classical "front" - that is, a flat decorated portal stuck into the curved body of the building. The main portion of this entrance is the frieze dominated by a carved head of Neptune, god of the seas, who is surrounded by shells and tridents, his watery attributes. Syracuse, NY. Elon P. Stewart Reservoir in Thornden Park, Entrance portal. Photo: Samuel D. Gruber 2017. Syracuse's water system was first organized in 1841, using hollowed out logs to move water from spring fed reservoirs to the center of town. This technology had already been perfected in the salt industry, where hollowed logs were a regular feature to move water. By the 1880's the need for water had greatly increased as the population boomed, and a more reliable source was needed. and logs were no longer used - since most local forests had been clear cut for farmland. Iron and lead pipes became the favorite conduits of the water - no one considering the now-obvious contamination problems. After much debate, Skaneateles Lake was chosen as the city's new water source. Two side by side cast iron pipes were laid over a 19-mile route between the lake and Syracuse. Although laying pipe through solid rock, across ravines, and through quicksand was a difficult task, in 1894, after 5 years of construction, the pipeline was complete. City water was stored in Syracuse Reservoir now called Woodland. In the 1920's, two “above tanks” called standpipes, were built one at Woodland and one at Thornden. In 1992 the water tower was repaired. Exterior renovation included replacement of the roof, repair of masonry, removal of graffiti, application of sealer to the masonry, and installation of both security lighting and a wrought iron fence around the tower to protect it from future vandalism. In 2014, $2.9 million was spent culminating in a new, 11 ton aluminum roof (pictures of it going up here; and video here). The work was needed because of severe roof deterioration and of 16 concrete columns inside the structure that support the roof. The views west and especially north from the sprawling grassy lawn around the tower are spectacular. These photos do not do them justice. On July 4th it is traditional for neighborhood families to gather on the great lawn and watch the fireworks from the fairgrounds or the stadium to the north, as little - and not so little - children delight themselves rolling down the green hill. Syracuse has many parks, big and small. Many of these - especially of the small ones - are often in out of the way places, and are sometimes found on left over land. A number of parks include high places, often the summits of drumlins, which were not always desirable for building. Or, these spots might already have been singled out and sometimes privately developed for recreation in the 19th century as popular destinations because they offered expansive vistas and salubrious breezes. This summer (my dog) Luna and I will be a exploring many of these high places - and we hope to report back. Sometimes, as in the case of Westminster Park, summits and other green spaces were left open in the center of larger building tracts as a way of attracting nearby residential development. This was the case of Westminster Park, a former sheep pasture, that was deeded for a park by the original Westminster Tract developers in 1890. 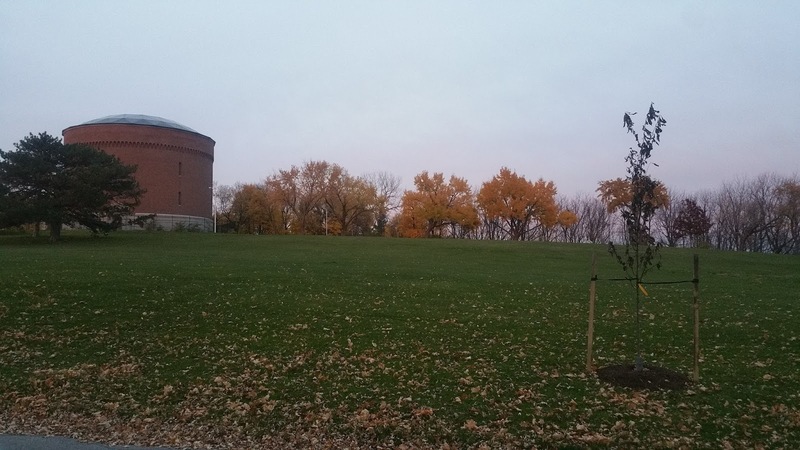 The 4.784 acre park sits at the end of Westminster Avenue atop a 655-foot drumlin and offers superb vies of Syracuse and Onondaga Lake – better when the foliage is not full. 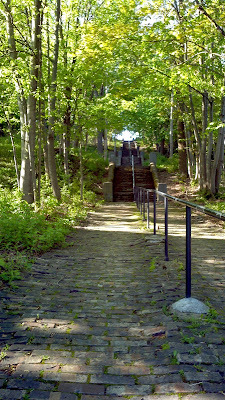 It is now connected to Euclid Avenue by steps which were added later. From 1890 to 1910 the city did little to improve the property except to develop Westminster Avenue and a sidewalk around the top of the drumlin. In 1890, ambitious plans were promoted for the erection of a rustic Gothic style resort hotel at the highest point – where the park is now. Like so many plans in Syracuse – these went nowhere. Still, these are telling about how this part of the city was perceived at the end of the 19th century. Syracuse, NY. 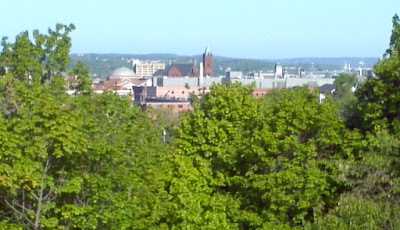 View looking west from Westminster Park to University Hill andbeyond. Photo: Samuel Gruber 2012. The real estate market is quiet just at present and the agent finds little more to do than to sit in his office, smoke cigars, and plan for the future. A talk with real estate dealers will disclose that these plans for the future are being made on a gigantic scale. It is a prevailing impression among real estate men that the boom a [sic] their particular line in the spring will be something enormous. Each, of course, claims that the greater boom will be in the direction of his particular tract. While there is no doubt but that considerable will be done in all directions, judging from the present outlook, the boom will open strongest in the eastern and southern portion of the city. The tracts lying in this direction are the Easterly tract, the Westminster tract, the Hillsdale tract and the University homestead tract. Twenty years later, people were still waiting for park improvements. The Syracuse Journal reported on Oct. 22, 1910 that “Superintendent Campbell said to-day (sic) that the people of the seventeenth ward were entitled to have the park improved, as the people of that land pay a large portion of the city’s tax, with their residences being very valuable,” the article read. In the years that followed, the staircase and connecting tramp sections from Euclid Avenue to Westminster Park was constructed, trees were planted and a gazebo (now gone) was built to host the families traveling by trolley to enjoy the view. The well maintained a regularly mowed green oval in the center of park resembles a traditional bowling green - a place for lawn bowling (similar to the Italian bocce). I wonder if bowling has ever been played here? There are similar ovals atop other city summits. I'll have to check with the Parks Department and see if there is interest in an outdoor bowling league - or at least a one day affair. I've written about other parks on this blog.Click here for more on Thornden Park, and here for Fayette Park. I've written about many public monuments on this blog, especially war monuments, such as the Soldiers' and Sailors' Monument at Clinton Square and The Hiker at Billings Park. 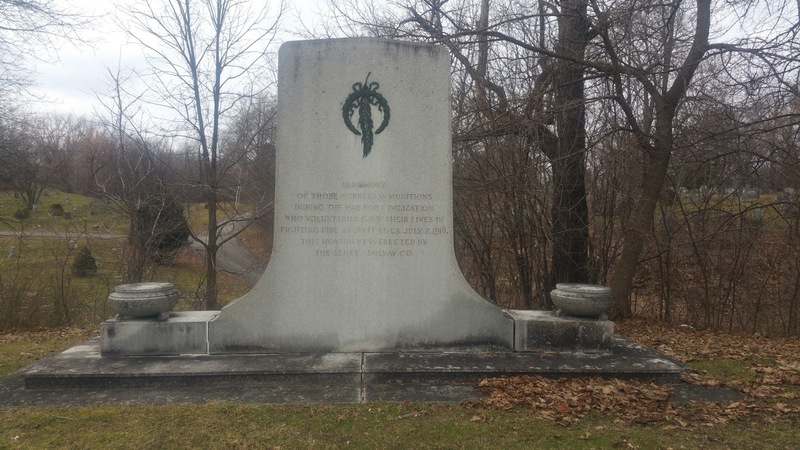 But one of the most unexpected war monuments in Central New York and probably among the least known is the striking memorial erected to the victims of the terrible Split Rock Explosion of 1918 and located in Oakwood Cemetery. Since we are in the midst of commemoration of the centennial of American entry into World War I, let's take a look. The elegant stone monument is a large high thin slab flanked by two low stone urns, and it sits on the edge of Oakwood's raised section B, originally part of Morningside Cemetery, not far from Comstock Ave. It is in distinct contrast to traditional war monuments with their heroic statues of fighting men, such as the one in Billing Park to the Soldiers of Thirty Eighth Infantry United States Army, shown above). Although the dead remembered here were victims of the World War I effort, their deaths came far from combat, and thus their remembrance is largely outside the mainstream of World War commemoration. the explosion is more often mentioned in the context of catastrophic industrial accidents then in lists of casualties of war. The Semet-Solvay Company manufactured explosives during World War I, for which work they purchased an abandoned quarry called Split Rock in the western hills of Syracuse, where they began producing TNT on site in 1915. On July 2nd, 1918 a mixing motor in the main TNT building overheated and ignited nearly three tons of explosives. The building was destroyed, fifty people were killed, and dozens injured. From my reading it is not clear to me how many died in the explosion and how many fighting the fire. The Semet-Solvay Company erected this monument which mentions those who "voluntarily gave their lives" fighting the fire. It seems, based on a newspaper article, that fifteen victims must be buried here. In memory of those workers in munitions during the War for Civilization who voluntarily gave their lives in fighting fire at Split Rock July 2, 1918. 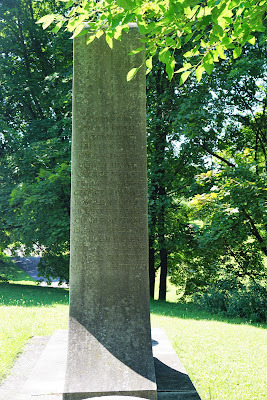 This monument is erected by the Semet-Solvay Co.
"These - the unidentified dead - are buried here"
Then fifteen names are listed - is it that the remains could not be separated and identified? These are probably the fifteen mentioned in the newspaper article of August 6, 1918, since Protestant, Catholic and Jewish clergy officiated - and the names listed suggest victims of all three faiths. Next time you are in Oakwood, go pay your respects.